Wild Mouse is gone, but not forgotten. One Christmas, a young Sam Denney received a Bump and Go: a police car with a ﬂashing light that drove itself around, changing direction when it bumped into something. most kids would be content with that, but an inquisitive Denney took the toy apart because he wanted to know how it worked. And, luckily, because he’d requested a soldering iron for the previous year’s Christmas present, he was able to put it back together again. Today, his obsession with how things work continues: both in the motorcycle he tells me is almost always lying in pieces in his garage, and in his work on Planet Coaster, Frontier’s deep, customisable theme park sim. As I talk to Denney he builds rollercoasters on a blank Planet Coaster park, zooms in, and explains how they work in incredible, excruciating detail. Most of it goes over my head, but his enthusiasm is strangely infectious. One he builds is a faithful replica of a classic coaster that’s a hundred years old, and he focuses the camera on the red leather seats, taking great pride in the fact that you can see the ‘bumprints’ of the thousands of people who have ridden it over the years. But the detail in Planet Coaster isn’t just superficial: the mechanisms that actually operate the rides are completely accurate, and they prevent players from building anything that wouldn’t work in real life. “We don’t do magic,” says Denney. “That’s a big thing for us. It’s always a mantra for me that if something doesn’t work in the real world, it doesn’t work in Planet Coaster. One of the biggest pillars of the game is grounding everything you build in reality. Even our animatronic models (used to decorate your park) have pistons and motors operating them. I think this creates a better sense of connection for people playing the game. 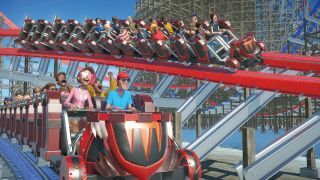 The physics system that drives the coasters has existed in some form for years, going as far back as 2004’s RollerCoaster Tycoon 3, according to Denney. “We have a really good physics simulation and it’s based on elements such as forces of gravity, wind resistance, weight and friction.” He adds that older coasters generate a lot more friction because of their heavy nylon wheels and thick tracks, which is reflected in how they move in the game. “I was obsessed with this kind of thing as a kid,” says Denney on one of his many enjoyable tangents. “Automatons, clockwork robots. That weird owl from Clash of the Titans. And that insane level of detail has always appealed to me.” As he tells me this he zooms into the interior of a monorail model, which players never see, and explains that it’s all been designed to work like it does in real life. I have met a lot of excitable game developers in my life, but never one as wildly passionate about the small details as Denney is. Honestly, until I spent time with Denney, I had no idea Planet Coaster was as realistic as it is. Its rollercoasters are something I only ever viewed from above, assuming Frontier simply animated a train moving along a track. But the fact that every element of the engineering and physics of a rollercoaster has been accounted for, and simulated, is hugely impressive. And I can see why coaster enthusiasts are so enamoured of the game.